Welcome to summer! How sick are we that we have barely turned off the lights to our classroom, and we are prepping for the fall! LOL! I'll admit that these summer months staying focused on being a better teacher are a joyous time for me. I drink my coffee, read blogs, cruise Pinterest, and rethink what I've been doing. The question is: what brings you to explore Guided Math by Laney Sammons? I think Chapter 1 really addresses what brings many teachers to explore teaching math outside of the district-issued curriculum. The author even admits that she felt very comfortable differentiating in reading and knew that math needed to be addressed the same way! I have felt this way for years. I feel very successful and confident in my knowledge base in teaching math. My whole group teaching is extremely effective. And yet-I know it is impossible to reach all my students that way-now matter how interactive and engaging my lessons are. Laney ('cause she's our friend now, right?) acknowledges that whole group instruction has its place and it is effective. I love that she also calls this teaching being a bit "on the fly". Duh, it really is! You never really know what questions will pop up. And boy do you have to know your stuff! You can't really stand with your manual in you hand. 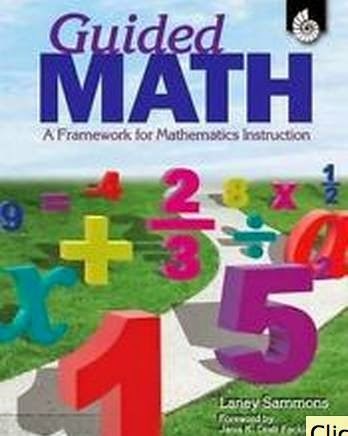 The framework of the book is pretty much laid out for the reader in this chapter to know the path we will follow in our journey in implementing a Guided Math classroom. Since Laney will go deeper in the upcoming chapters, I'll just share the components that will be coming in the weeks ahead. At this point, I can't help but think about what I'm doing now, what parts might fit with this framework, how does this look like what I've done in the past? I am a super-reflective reader, so I will try to make connections at every turn. Pretty hard to blog about THAT much! Laney must know teachers are like this and closes the chapter with questions to ENCOURAGE this kind of thinking. I just completed my second year of Envision Math-Common Core edition. We've had a lot of inservice training. Not all of it good. What I do like about the manual is the "Pose the Problem" section. This is a time to ask a question before instruction has taken place and allow kids the "struggle time" to try solving it. Group work is strongly encouraged. Laney refers to the good aspects of Whole Group teaching as Math Huddle. I never skim past this section, as it forces my kids to think. I know very quickly who already senses or is going to quickly be on track and those who need more questioning to get on track(and to watch a bit closer later in the lesson) as I monitor the room. Once we all come back together, I often display their whiteboards on my Elmo for all to see. Showing that several groups can have a right answer-but get there in a different way-is very empowering to my students. Some like to be unique and others want to be validated. Even wrong answers can have interesting problem solving strategies that others can benefit from. Something has to trouble us or give us a feeling of doubt if we are looking for new paths, right? The traditional path of guided practice and independent practice doesn't work for all kids. While Envision gives these great center activities, I have never used them. Whole group teaching takes up so much time that there is little time for book work AND centers. I'm not confident enough in the centers to let THEM stand alone. Knowing they have to read and problem solve in assessments, I tend to make sure they do a sampling of those for classwork. Envision does not have a "looped" mixed practice except in the Daily Common Core Review. Some of these are multiple choice and some aren't. 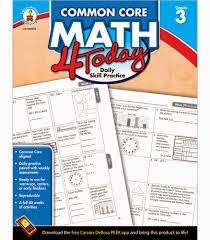 I want open ended problems to solve each day, so I use Math 4 Today as morning work to fill that gap. I don't think the program does enough to build the academic vocabulary on its own, so I do a lot of Interactive Notebooks. I also use A LOT of task card sets for review. You only need to look at my blog posts HERE and HERE to see a sampling that I make all the time. I can really focus on a strand or multiple strands to guide my teaching. All these extras take time. When you have 60 minutes, it is really important to choose wisely. I'm extremely hopeful that this book with help me choose WISELY! Every minute counts and every CHILD counts. Finally, no math curriculum is going to embed an environment of Numeracy. This comes from us. I'm grateful that Laney recognizes this component to be explored deeply before we ever get to what a Guided Math classroom lesson or week looks like. Now for the GOODIES! To thank you for popping in each week, Primary Gal is putting together the giveaways for us! You're not going to want to miss a chance at any of these! I'll be donating, too! That's it for this week! Be sure to check out all my friends! We're all in this together. I know I'll be popping in to read their perspectives. I'm looking forward to getting the creative juices flowing this summer! I agree that time is always an issue for me. What starts as a mini lesson turns into a full blown teacher directed lesson. I'm looking forward to gaining more insight as we read this book.